GEM Cable Solutions is proud to present our established clients and new customers with a comprehensive portfolio of telecommunications products from selected vendors RAD Data Communications and TC Communications. RAD Data Communications is internationally recognised as a leading manufacturer of network access equipment for data communications and telecommunications applications. RAD solutions reduce infrastructure and operational costs while boosting competitiveness and profitability of both mature circuit-based networks and next generation Ethernet/IP/MPLS access topologies. GEM has chosen to offer the RAD product range as it provides a versatile range of solutions for voice services, data interfaces, dependable networks and flexible topologies, from carrier Ethernet to multi-service access to last-mile. We are also an authorised distributor of TC Communications, who design and manufacture Ethernet, Voice and Data communications equipment for fiber optic networks, with over 60 different products in its portfolio. Together, these products combine to provide reliable, efficient solutions to fiber optic communication networks and connectivity applications including integrated Ethernet, Data and Voice solutions. The products will suit solution requirements of customers ranging from top-tier service providers, power utilities, transportation companies, to regional and national government organisations. Click here for RAD or TC Communications and get a brief descriptions of key example products from the broad portfolios, however please contact us to discuss any specific requirements you may have. RADview is a modular network management suite for RAD’s Service Assured Access and Service Assured Networking solutions. It enables configuration, provisioning, monitoring, and management of networks and services. For deployment on a range of operating systems and supporting various APIs, RADview is based on distributed client-server architecture featuring an embedded Oracle database and open standard interfaces. The Java-based suite of software comprises four modules: EMS graphical user interface, Service Manager for service creation and activation, Performance Monitoring for SLA assurance, D-NFV Orchestrator for virtual function applications. RADview can serve as a mediation layer between the various Network Elements (NEs) and, via standard northbound interfaces, higher-level OSS and umbrella systems, communicating essential network information to service, operations and business management functions. RADview management and orchestration suite features an intuitive UI/UX to simplify configuration and enable zero-touch service provisioning end-to-end, minimising integration costs associated with NE additions. The system is scalable, providing solutions for small installations to growing networks. RADview is fully compliant with the ITU-T Telecommunications Management Network (TMN) standards, and features advanced fault, configuration, administration, performance, security (FCAPS) capabilities. Using an SNMP southbound interface, it also includes third-party device monitoring capabilities. RADview’s northbound interface enables integration into a third-party umbrella system (OSS). The RADview Performance Monitoring module enables ongoing monitoring of Ethernet and IP service performance by collecting KPI (key performance indicators data from RAD devices. Part of RAD’s Service Assured solutions, it allows service providers and network operators to easily monitor and manage actual network and service performance over time and compare it to service requirements and SLA (service level agreement) guarantees. The RADview Performance Monitoring module enables immediate detection of service degradation, so that remedial actions are taken to quickly restore guaranteed performance levels. The system retrieves data lost due to connection failures and exports standard CSV ASCII files to OSS or third-party management systems. The RADview D-NFV Orchastrator uses the OpenStack framework to manage the physical and virtual resources required for effectively running Distributed NFV and for delivering service agility at the customer edge. It installs, configures and manages virtual machines on the x86 D-NFV module residing within RAD’s customer-edge devices. In addition, it manages the repository of RAD-certified VF (virtual function) applications and is used to download the applications to the device. Featuring a web client with state-of-the-art user interface (UI), the RADview D-NFV Orchastrator enables fast and easy service creation of value-added applications and provides status and utilization reports of the x86 D-NFV modules. The RADview Service Manager module is part of the RADview management suite and provides end-to-end management of MEF-based Carrier Ethernet services for Service Assured Access. An intuitive GUI, “point-and-click” functionality and easy-to-follow wizards facilitate planning, provisioning, monitoring, diagnostics, and SLA assurance, so that network operators can add new service offerings, as well as minimize overall operating costs, reduce provisioning times and maximize the efficiency of the entire network. The RADview Service Center path management system enables end-to-end management of RAD’s TDM access products, while easy-to-follow wizards facilitate provisioning and monitoring over SDH/SONET and PDH networks. Supported capabilities include automatic path routing, automatic re-routing of protected paths, physical and logical representation of the network links, and more. The system allows network operators to add new service offerings while minimizing overall operating costs, reducing provisioning times and maximizing the efficiency of the entire network. ETX-2 family of next-generation IP and Carrier Ethernet NID/NTU demarcation devices provide, with ETX-5, Service Assured Access (SAA) solutions over multiple access technologies including fibre, SHDSL, PDH, and SDH. ETX-2i offers carrier-grade virtual CPE platform with Distributed Network Functions Virtualisation capability. Featuring 1Gbps wire-speed router with Virtual Routing Instances, service providers can deploy Layer-2 and Layer-3 VPNs. Offering fast failure protection, diverse network topologies are supported, such as linear, daisy chain, hub-and-spoke and self-healing rings, working opposite ETX-5 devices. ETX-2 transports Ethernet over TDM infrastructure using NG-PDH technologies, improving network availability, reducing latency and optimising line utilisation and throughput. Smart (MiRICi) SFPs provide TDM connectivity over PDH / SDH legacy networks. Smart (MiTOP) SFPs provide TDM over Ethernet PseudoWire functionality and synchronisation. ETX-2 is ideal for carriers, service providers, wholesale providers, and mobile operators seeking to offer unified SLA-based Ethernet business services for enterprise and carrier-to-carrier applications as well as mobile backhauling applications. The ETX-2 line of next-generation IP and Carrier Ethernet NID/NTUs offers advanced demarcation for SLA-based business services, wholesale services and mobile backhaul. Part of RAD’s Service Assured Access solution, it is available in various ordering options, including field-pluggable x86 NFV modules for hosting virtual network functions (VNFs) which were specially designed as virtualized CPE (vCPE) platforms. Featuring a high-scale, built-in router and modular network interfaces for any access infrastructure, the ETX-2 support up to 48 Gbps, with high capacity service provisioning, performance monitoring, and application awareness capabilities. Moreover, its future-proof design and innovative architecture allow dynamic forwarding to enable service chaining flexibility for embedded and virtual functions, as well as fit software defined networks (SDN). Available as a modular demarcation device, the ETX-2i enables operators to deliver the most advanced Carrier Ethernet services and IP VPNs over any network connection. It features a high capacity switch/router and a powerful x86 server for hosting virtual functions. In addition, the ETX-2i incorporates distributed Grandmaster functionalities, installed as a cell-site aggregator or at cellular towers and controller sites to guarantee differentiated SLAs for LTE/LTE-A mobile operators, while cutting down provider costs by minimizing equipment needed for timing and demarcation. ETX-2i-B is an entry-level demarcation device for remote branches and SMBs delivering advanced SLA-based Ethernet and IP business services to the customer premises over native Ethernet access. It is ideal for carriers, service providers, and wholesale operators requiring advanced Ethernet L2/L3 functionality at customer premises and multi-tenant units (MTUs). The ETX-2i-10G combines intelligent demarcation and aggregation capabilities to deliver high bandwidth, SLA-based Carrier Ethernet services for enterprise customers and mobile backhaul operators. As a demarcation solution, the ETX-2i-10G is used for managing the service hand-off at an enterprise headquarters handling a large volume of traffic. Alternatively, it can be used as an aggregation solution at the concentration point, where a single unit can support numerous services and concurrent OAM sessions. Contact your local RAD distributor for additional/new application information. Available as a modular demarcation device, the ETX-203AM enables operators to deliver Carrier Ethernet services and IP VPNs over any network connection. This reduces carrier TCO and simplifies purchasing, homologation, training, service production, and management integration. ETX-203AX delivers SLA-based Ethernet business services to the customer premises over native Ethernet access. It handles up to 5 Gbps of user traffic at wire-speed and is ideal for carriers, service providers, and wholesale operators requiring advanced Ethernet functionality at customer premises and multi-tenant units (MTUs). The ETX-205A provides advanced Carrier Ethernet demarcation and offers combo interfaces and power supply redundancy. As a demarcation device for mobile backhaul, the ETX-205A incorporates distributed Grandmaster functionalities, and is installed at cellular tower and controller sites to guarantee differentiated SLAs for LTE/LTE-A mobile operators, while cutting down provider costs by minimizing equipment needed for timing and demarcation. Optimized for high speed access applications, the ETX-220A combines intelligent demarcation and aggregation capabilities to deliver SLA-based Carrier Ethernet services for enterprise and carrier-to-carrier E-Access applications. As a demarcation solution, the ETX-220A is used for managing the service hand-off at an enterprise headquarters handling a large volume of traffic, at carrier inter-connects, or between provider networks. Alternatively, it can be used as an aggregation solution at the concentration point, where a single unit can support numerous services and concurrent OAM sessions. ETX-5 is a powerful access aggregation platform successfully deployed worldwide in many large networks that offers, with ETX-2 and MiNID, Service Assured Access (SAA) solutions for building optimised access networks. ETX-5 provides first level aggregation at the POP, E-NNI inter-carrier demarcation and delivers TDM pseudowire traffic from the access network to the provider edge over Ethernet links. This 3U modular system features high port density for space-restricted facilities. The fault-tolerant hardware design with fully redundant timing, management and power sub-systems, prevents service downtime. ETX-5 features non-blocking architecture, allowing wire-speed forwarding of all packet sizes. It is designed for high availability and “Always-On” service. ETX-5 is Carrier Ethernet 2.0-certified and can be utilised for carrier-to-carrier connectivity applications complying with MEF 26, as well as for high capacity grooming of Ethernet OAM and performance monitoring sessions. It is ideal for service providers and critical infrastructure to deliver SLA-based business services, legacy TDM service emulation and mobile backhaul, over Ethernet. The ETX-5 is a leading CE 2.0 access aggregation switch, successfully deployed worldwide in many large networks. It delivers aggregated Ethernet and TDM pseudowire traffic from the access network to the PE (provider edge) over 10-GbE links. Part of RAD’s Service Assured solutions for service providers and critical infrastructure, the ETX-5 is ideal firstlevel aggregation at the POP, E-NNI inter-carrier demarcation and as a pseudowire gateway for seamless migration to packet networks. For an enhanced user experience, the ETX-5 is supported by the new RADview management and orchestration system, featuring an intuitive UI/UX to simplify configuration and enable zero-touch service provisioning end-to-end. The ETX-5 is Carrier Ethernet 2.0-certified and includes an extensive toolset to deliver and manage SLAbased services. 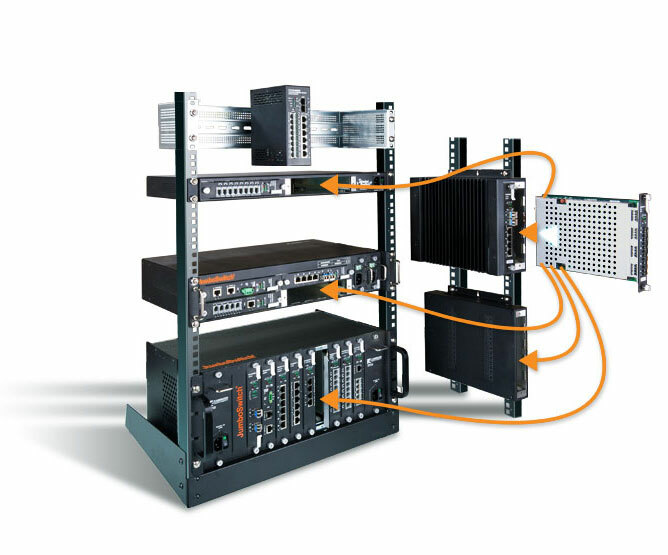 The ETX-5 is a leading CE 2.0 access aggregation switch, successfully deployed worldwide in many large networks. Next-Generation Multiservice Access Node, RAD’s Megaplex is a carrier-class, high capacity multi-service access ‘concentrator’ for delivering legacy and next-generation services over PDH/SDH/IP transport networks. It is an STM-1 add/drop multiplexer that transports Ethernet and TDM traffic over SDH networks. It additionally offers an IP connection for packet-based Ethernet traffic links. The ability to handle a broad range of data and voice services and various network technologies makes it a versatile, flexible, scalable and cost-effective next-generation multiservice compact managed access node. Megaplex-4 can act as a central aggregation unit for TDM and Ethernet CPEs connected over various access links. The modular, distributed architecture enables redundancy with no single point of failure. A powerful internal matrix offers a non-blocking cross-connect for a high volume of traffic directly from and to any tributary channel. Perfect for large enterprises, utilities and transportation companies requiring an efficient way to provide multiple legacy and next-generation services over high capacity pipes. RAD’s Megaplex-4 is a carrier-class, high capacity multiservice access concentrator for delivering legacy and next-generation services over PDH/SDH/SONET, or over packet switched transport networks (PSN). Its ability to handle a broad range of Ethernet, data and voice services, as well as a large variety of network technologies, in a single compact managed node, makes it an ideal core/edge solution for carriers and service providers. The device also provides a perfect fit for large enterprises, utilities and transportation companies who require an efficient way to transport and provision multiple legacy and next-generation services over their high capacity pipes. Megaplex-4 can be used as a central aggregation unit for TDM and Ethernet CPEs that are connected over various access links. The Megaplex-4 is available with a cable management solution to reduce storage space and handling, and eliminate cable waste. Central site solution, major building block of RAD’s portfolio for service providers, carriers and utilities, Megaplex-4 functions as a carrier-class, TDM and Ethernet aggregator, as well as a high capacity DS0 cross connect and next generation multiservice access node. It transports legacy and next-generation services over any infrastructure for seamless migration. The Megaplex-4 family includes two devices: a larger 10-slot Megaplex-4100 and a compact 4-slot Megaplex-4104. When deployed as a carrier-class Ethernet aggregator, Megaplex-4 can terminate Ethernet traffic carried over E1/T1/SHDSL/SHDSL.bis/fiber links or native Ethernet copper and fiber, as well as through a VCG in the SDH/SONET circuits. This traffic can then be switched either to a different PDH/TDM trunk or to Ethernet ports. • Dual network owners using SDH/SONET for voice, and packet for data. Its ability to handle a broad range of Ethernet, data and voice services, as well as a large variety of network technologies in a single compact managed node, makes Megaplex-4 an ideal core/edge solution for carriers and service providers. It also provides a perfect fit for large enterprises, utilities and transportation companies that require an efficient way to transport and provision multiple legacy and next generation services over their high capacity pipes. ASMi family of products are SHDSL modem/multiplexers for data and voice, operating in full-duplex mode over 2-wire and 4-wire lines. Multiple data rates of between 64 to 4608 kbps are supported. The data rates depend on the line interface, DTE interface types, and operating clock modes. ASMi-52 SHDSL multiplexer and ASMi-52L SHDSL modem transmit E1, Ethernet or serial data streams on an SHDSL link at various data rates of up to 4.6 Mbps. ASMi-53 SHDSL.bis CPE modem is a cost-effective device for extending V.35, E1 and mid-band Ethernet services over multi-pair bonded copper links. ASMi-54 line includes the multi-port ASMi-54 advanced SHDSL.bis modem, the cost-effective ASMi-54L SHDSL.bis modem and the ASMi-54LRT managed SHDSL.bis modem with integrated router, as well as a card module (ASMi-54C) for the Megaplex-4 chassis. ASMi products employ standard SHDSL TC-PAM technology to extend the transmission range thus enabling carriers to reach more customers at lower costs. The ASMi-52 SHDSL multiplexer and ASMi-52L SHDSL modem transmit E1, Ethernet or serial data streams on an SHDSL link at various data rates of up to 4.6 Mbps. Incorporating TC-PAM technology for extending the transmission range, the SHDSL modems enable carriers to cost-effectively reach more users with copper lines at higher data rates over longer distances in the First Mile. The devices address the data transmission and Ethernet extension needs of enterprise users. Typical users include municipalities, utilities, corporate connectivity, and cellular backhaul providers. MiNID is a field-programmable miniature L2/L3 Network Interface Device (NID), available as an SFP sleeve and in a standalone enclosure. Part of RAD’s Distributed Network Functions Virtualisation (D-NFV) portfolio and provides, with ETX-2 and ETX-5, RAD’s Service Assured Access (SAA) solution. MiNID provides a revolutionary platform for instant upgrade of legacy switches and routers by transparently enveloping SFPs, preserving existing investments by enabling reuse of equipment and seamless deployment over multiple access infrastructure types. MiNID delivers reliable bandwidth with end-to-end SLA assurance guarantees. MiNID is a true plug-and-play solution. Its zero-touch provisioning capabilities enable easy installation by anyone. The NID sleeve is pluggable into standard SFP ports, and provides comprehensive OAM tools with remote management, enhancing demarcation, performance monitoring and fault diagnostics. MiNID offers service providers, mobile operators and wholesale carriers the perfect solution for assurance in business services, allowing the introduction of new services quickly while increasing operational efficiency. The MiNID features a fully programmable, FPGA based firmware for maximum flexibility. It enables easy download of demarcation and networking applications using the RADview D-NFV Orchestrator or other 3rd party management systems. Service demarcation, PM and diagnostics for MEF Carrier Ethernet 2.0 and IP services with SLA assurance. Application-aware demarcation with service monitoring providing up to L7 visibility and policy enforcement to improve Quality of Experience. The MiNID SFP sleeve is easily pluggable into SFP ports of switches and routers and eliminates the need for standalone demarcation devices. It seamlessly hosts standard FE and GbE SFP modules, and delivers substantial OpEx savings by eliminating additional power, space and cabling expenses. The MiNID is also available in a miniature standalone enclosure, with a variety of user and network port options for maximum interface flexibility. Optional bypassrelay functionality ensures fail-safe operation and Power over Ethernet (PoE) support eliminates the need for an additional power supply. Service demarcation with tunneling of L2 services over L3 networks Contact your local RAD distributor for additional/new application information. Migrate your network to an IP world. Take your legacy device network with you. Designed for large and small networks, mission critical requirements, future growth and your network manager’s sanity. More than 25 interface cards and 6 chassis options. Based on advanced Ethernet, TDM over IP and VoIP technology, JumboSwitch® supports all popular legacy termination devices including RTUs, AMRs, PLCs traffic controllers, telephones, modems, FAX machines, bank ATM machines, data modems, power protection relays, etc. Remote and real-time monitoring of vital network statistics including bandwidth usage, device temperature, power consumption, optical launch and receive power, and automatic alerts. A Multi-User web-based SNMP Network Manager. It is based on the ITU-T Telecommunications Management Network (TMN) model with advanced FCAPS (Fault, Configuration, Asset, Performance, & Security) capabilities. Based on advanced Ethernet, TDM over IP and VoIP technology, JumboSwitch supports all popular legacy termination devices including RTUs, AMRs, PLCs traffic controllers, telephones, modems, FAX machines, bank ATM machines, data modems, power protection relays, etc. JumboSwitch® can be used in edge applications providing support for legacy devices over existing user communications networks. JumboSwitch® provides a highly effcient of deploying an Ethernet based communications backbone while maintaining support for previously established systems. All JumboSwitch® Interface cards are modular and can be used with all four chassis and cage options including 1U, 2S, 2U and 4U. This allows for pay-as-you-grow scalability. Future proof migration, including 10GigE, is guaranteed. All JumboSwitch® interface cards are hot swappable; that is, they can be removed or replaced during operation without powering down a node or system. All key traffic engineering parameters on Ethernet cards (including VLANs, traffic prioritization, and port/card rate limiting) are downloaded automatically to the new interface card. This minimizes down-time and helps prevent configuration mistakes due to human error. Currently offering 6 different chassis types and 25 legacy interface cards including RS-232/RS-422, FXS/FXO, T1/E1, T3/E3, G.703, 600 Ω analog, and more.